You can make a GridSplitter element look like a more traditional three-dimensional element by using a Border and a gradient fill. This will make it more obvious to the user that it is something that they can grab with the mouse. 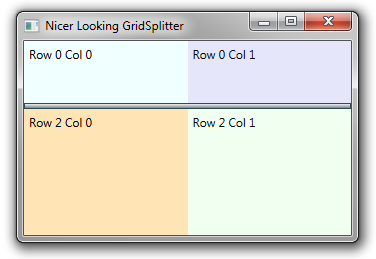 In the XAML snippet below, the GridSplitter has a dark grey border and a gradient fill that goes from white to gray. <GridSplitter Grid.Row="1" Grid.ColumnSpan="2" Height="6" BorderThickness="1" BorderBrush="DarkSlateGray"